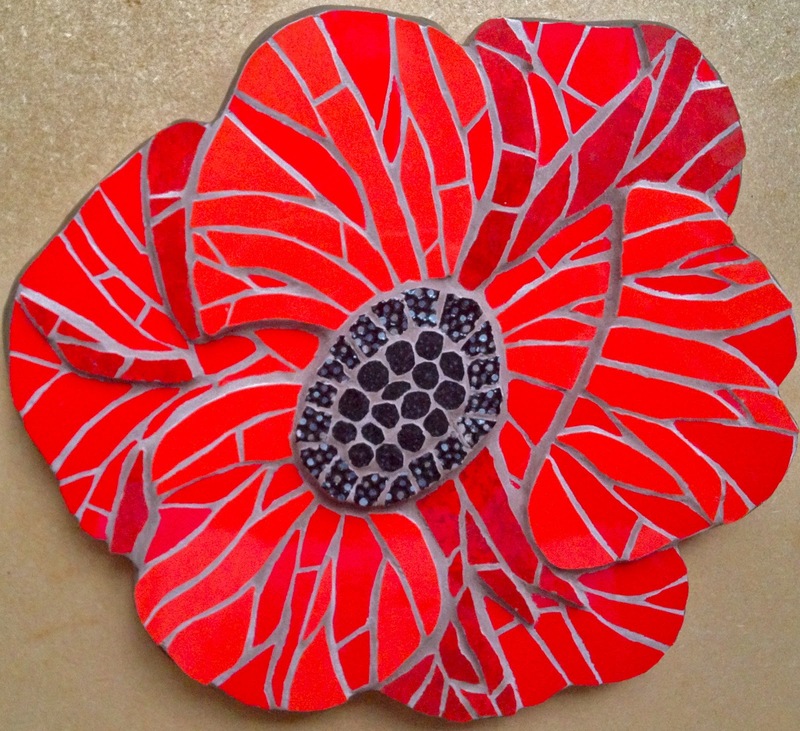 Felicity Ball mosaics: How I made a mosaic poppy! 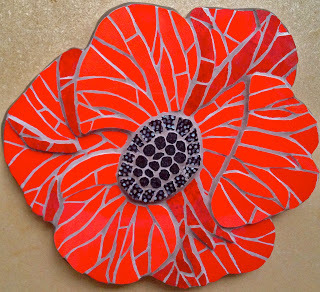 How I made a mosaic poppy! 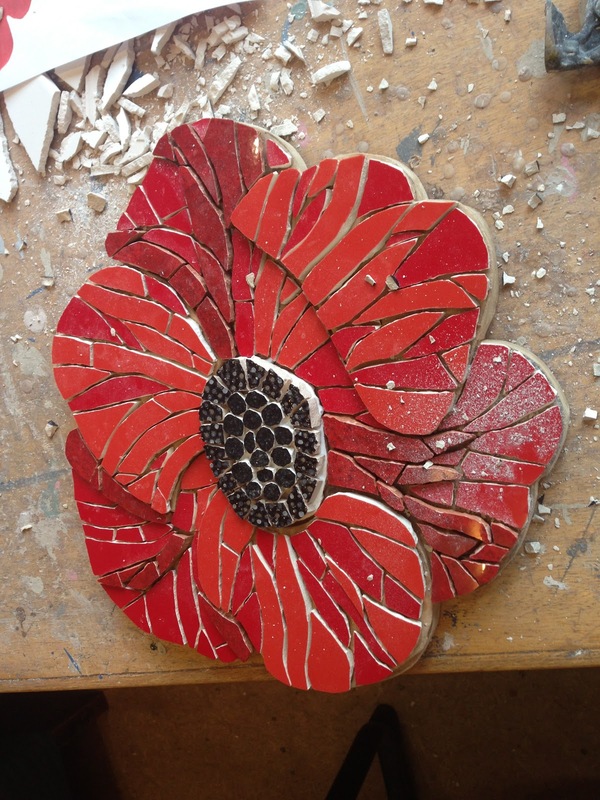 I thought you might like to see the process I went through making a mosaic poppy, for the Royal British Legion in Bristol. They are going to auction it at a fundraising event in February. 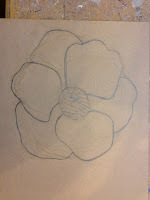 Sorry about the quality the photos - but that's how it is in the studio! 1. Design poppy and draw on 12ml MDF - this one is about the size of a large dinner plate. 2. 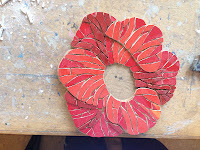 Make templates for the inner petals, to give a 3D effect, and cut them out in 6ml MDF. 3. Stick the inner MDF petals on the poppy and start cutting and sticking the tiles. 5...until it is, as you want it! 6. Cut middle tiles to look like seeds and stick them in - a bit fiddly! 7. Get grouting and cleaning! My fingers are my best tools, but they suffer afterwards! Thanks for the sharing. Excellent your Mosaic Tiles related goods Home Improvements vast Defferent tiles products here tfo in australa. I love the 3D effect! 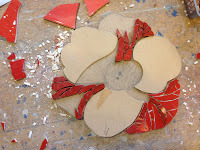 Thanks for leaving a comment - I write in my blog most Fridays now about all things mosaic - why don't you become a follower?! Love your work. Thanks for sharing your secrets. How do I follow. Where do you find colored tiles? I can't find any. Hi there! Love your work! Where do you get all those clay tiles from? I've been looking and can't find any. Are they old backsplash tiles or floor tiles? Thanks. Mosaic tulips - great for gifts, great for you! Just Mosaics premiers on YouTube!